This undated photo shows Deng Senshan before he was brutally beaten to death at a Web addiction camp in Nanning, Guangxi Zhuang Autonomous Region on August 2. Lost in grief, Deng Fei is also filled with remorse for sending his son to an Internet addiction treatment camp in Nanning, capital of Guangxi Zhuang Autonomous Region. 15-year-old Deng Senshan died just 13 hours after he arrived at the camp on August 1. Shortly after he arrived, the middle-school student was locked in a room and brutally beaten by camp "counselors." In the early hours of August 2 he was rushed to a local hospital, but doctors were unable to save him and he was pronounced dead at 3:15 am. Mr. Deng said his son was a good boy, not at all spoiled. He had worked hard at school and done well in examinations until, at the age of 11, he plunged into the world of online games. 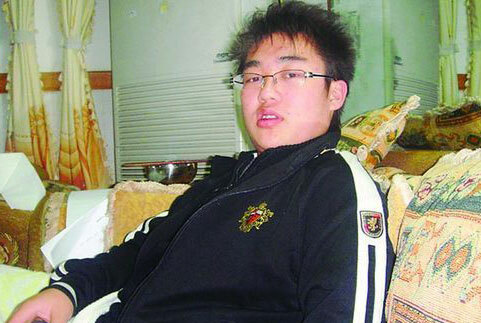 From then on, every day after school he would rush to nearby Internet cafes. Sometimes he would stay out all night. His parents became desperately worried. But Mr. Deng tried to understand his son. "He was just like an adult addicted to tobacco or alcohol. Even grown-ups can't control their addictions, let alone children who have less self-control." To keep Senshan out of Internet cafes, Mr. Deng bought him a computer. This at least brought him home in the evenings. But Deng said that even at home, "he did not eat, sleep or do his homework. He spent all his time playing online games." Then one day Mr. Deng saw a TV commercial for the Nanning Qihang Salvation Training Camp. He saw a glimmer of hope that he could break his son's addiction. The camp offered a one-month treatment program for 7,000 yuan (US$1,024). Despite the high cost, Deng enrolled Senshan. He thought that, at the very least, the boy would get away from online games for a month and the camp's military-style regime might force him to take exercise and lose weight. The whole family travelled from their hometown, Guilin, to Nanning where they were given a tour of the camp and met the other trainees who impressed Mr. Deng with their politeness. Mr. Deng was persuaded to sign his son onto a one-month program starting August 1. According to the contract, the camp did not rule out the possibility of "educating the children by subjecting them to hardship and punishment" but promised "not to abuse the children or harm their health." But just the next morning, Mr Deng was notified that his son had "developed a condition." When he rushed to the hospital he saw the last thing he was expecting; his son's dead body covered with blood and bruises resulting from a brutal beating.